Is This the Solution to the Inevitable Social Security Crisis? This may sound like an April Fools’ joke, but, trust me, it’s not. That’s just how unbelievable it is. It’s the kind of Eureka! discovery that can only occur in the wee small hours of the morning after endlessly toiling away at numbers and statistics and statistics and numbers. And the beauty of it is that it works! What if I told you there was a low cost way to wipe out the need for Social Security within one generation — and not only would it not cost the government a dime but it would generate massively more tax revenue. Would you believe me? Or would you call me an April Fool? Most folks would bet on the latter — and most folks would be wrong! It was while writing an article that is the basis for Hey! What’s My Number? 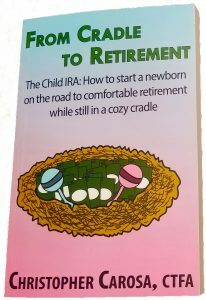 – How to Improve the Odds You Will Retire in Comfort that the idea of The Child IRA hit me like a ton of bricks. There I was, playing with numbers in my spreadsheet models when, like a chemist whose accidental spill leads to the discovery of a fabulous cure, I inadvertently started at year 0 instead of year 15. (You’ll have to read Hey! What’s My Number? to understand the significance of starting at year 15.) Curiosity getting the better of me, rather than correcting the error, I extrapolated upon it. Lo! And Behold! came the answer that is guaranteed to solve our nation’s alleged retirement crisis. OK, OK, I said I was willing to concede the point that there really is a retirement crisis. And, admittedly so, if you consider Social Security a component of retirement, then, sooner or later, like any other Ponzi Scheme, we will find ourselves in a crisis. Only, the thing is, this idea allows Social Security to die a natural death, wiping away forever our mournful addiction to this gangster era racket. I’ll call it “The Child IRA.” It’s actually something a few elite folks have taken advantage of now, assuming their children have been modeling since before they could crawl. Its effect — without the tax-deferred benefits — can also be duplicated today, mainly via trust funds, but also through regular investment accounts. But what I’m proposing is not at all like these. It’s a tax-deferred account that doesn’t require earned income on the part of the primary beneficiary (i.e., the “Child” of The Child IRA). It would allow any adult (parents, grandparents or any other random unrelated adult for that matter) to contribute an aggregate total of $1,000 (pre-tax) to any child every year until they reach the age of 19. Think of it as a combination of the power of compounding found in the 401k plan with the contribution flexibility of a 529 plan. Here’s how it works. Every child born in the U. S. of A. would be allowed to accept up to $1,000 per year until their nineteenth birthday into their own “Child IRA.” Any adult can make a tax-deductible contribution into anyone’s Child IRA, so long as the total contributions to any single Child IRA do not exceed $1,000. The contributing adult does not have to be related to the child that owns the Child IRA. Now, are you listening? Here’s the beauty of the plan. All Child-IRAs would be required to be invested in long-term equities (preferably not through any government fund but through existing private investment vehicles like mutual funds in individual stocks). There’ll be none of this “risk aversion” stuff because you can’t withdraw from a Child IRA until age 70 (the “real” retirement age by the time today’s kids get there). With this kind of requirement, we’d expect these Child-IRAs to grow at the rate of return of stocks. Historically, that’s a tad above 11%, but let’s be conservative and say it’s 8%. Do you know what that means? That means, by contributing $1,000 a year from the year of birth until the 19th birthday (a total of $19,000 in contributions), a Child-IRA will be worth in excess of $2.2 million when the owner retires at age seventy. That’s on top of any other retirement savings that person might have. And with that $2.2 million head start, where is the need for Social Security? And what a head start it is! The Child IRA. It’s the answer to all our retirement woes. It obviates the need for Social Security (at least that part that deals with retirement). It doesn’t cost the government anything to implement. Best yet, it’ll leave the government with an ongoing tax windfall. According to the US Census, there are roughly 75 million children in the United States. If all Child IRAs are fully funded each year, that would defer taxable income by $75 billion. Another way of saying, based on the Tax Policy Center’s average Federal Tax Rate of 20.1 (for 2013, the latest year available), this would equate to a short-term loss of $15 billion in revenues per year. By eerie coincidence, according to the President’s 2014 budget, it costs $12.5 billion dollars to operate Social Security. But let’s not get ahead of ourselves. I said this wouldn’t cost anything and here’s why. Looking at the costs in another way, a fully funded Child IRA ($1,000 per year until that child’s nineteenth birthday) would require a total of $19,000 in total tax-deductible contributions. Again, assuming the average 20.1% tax rate, this reduces tax revenues by $201 per year for a total reduction of $3,819 over the nineteen years contributions are allowed. By age 70, when the child retires, assuming an average annual return of 8% (versus the historic average annual return for equities of 11.17%), The Child IRA would be worth $2,267,361. Furthermore, if the retiree now takes out 4% a year ($88,506) and pays the current average tax of 20.1%, the government will earn $17,790 in tax revenues a year. That’s nearly a 9,000% return on that $201 annual “investment” the government makes during the contribution period of the Child IRA. Not bad for doing nothing. Finally, that $88,506 is 58% more than the current median income of $55,775. Traditional retirement savings vehicles will still be needed because, like Social Security, the Child IRA is not intended to fully fund retirement. But, unlike Social Security, the Child IRA isn’t a Ponzi Scheme, doesn’t cost the government money (moreover, by eliminating the annual operating cost of Social Security, it’ll save the government money), and, in fact, it will increase government revenues. Like I said, it’s so obviously simple, why hasn’t anyone ever come up with it before? Moreover, why hasn’t it already been done? I mean, we’ve got the 529 plan. To get to The Child IRA, all we’d have to do is say 529 plans can be used for both education (which they’re currently limited to) and retirement. So again, why hasn’t this been done already? We’ll save this answer for the book’s final section (but I suspect you know the answer). For now, let’s not talk about what might be done if we waited long enough for the politicians to act. Let’s talk about what we could do now, by ourselves, without the need for legislation, regulatory approval, or any other third-party action. Let’s dive into The Child IRA as it is today. And, believe me, you’re going to want to read this because it really is as easy to do as what I just described – and just as lucrative for your children (and grandchildren).